Products made to order. Please allow for a lead time of 7-10 days before your order ships. There are simple wooden state cutouts and then there are the attractive, U.S.-made pieces from Grainwell. Each one is handcrafted to showcase home state pride in style. The Kentucky-made artwork highlights the skyline of your special state's signature city. Mixing reclaimed and new pieces of birch and walnut wood, each piece has a rustic, distinctive finish. Dimensions: KY, NC, & TN Small: 12" x 19"; Large: 18" x 29"; All Other Cities: 13" x 16"; Large: 21" x 25"
Weight: Small: 3 lbs. ; Large: 8 lbs. I bought this as a Christmas gift for relatives in Chicago. Beautiful gift and very nicely done. Purchased this as a gift for someone and they absolutely loved it - it is beautifully made and crafted. Excellent! This framed piece of art is even better looking up close than looking at a photo image. I'm excited to gift it to my son-in-law for Christmas. Great gift for a friend. Thank you! This arrived quickly and is beautiful! The craftsmanship is very apparent. It appears to be made well, and I think it will be treasured for years. 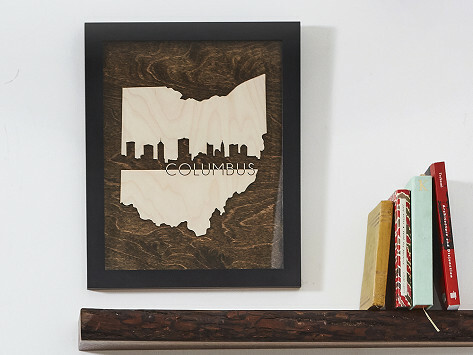 Showcasing state pride looks even better when it’s done with a handcrafted wooden state artwork from Grainwell. And because it’s Made in the USA, you’ll be showing your allegiance to your country, too. The pieces are made with a mix of reclaimed and new natural birch and walnut, creating a distinctive, rustic finish that also highlights the unique qualities of the wood. Each state incorporates an element of what makes it special—from its city skyline to its unique flag. Sisters Melyssa, Michelle, and Christine are three proud Kentucky girls who make each Grainwell piece. (Pup Dakota provides moral support.) 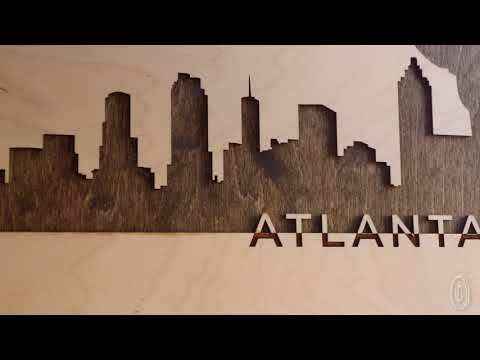 The trio does it all, from salvaging wood to applying the finishing touches in their workshop.